Update: Industry is looking into this technology as was clear at the Dutch Blockchain Conference, held at the KPMG office. Yesterday I visited the blockchain conference in Amsterdam. There is a string of these conferences around the world you can see the link here. The conference in the Crown Plaza business center in Hooftddorp could be called small. About 60 people, with a suprising number flying in from London. 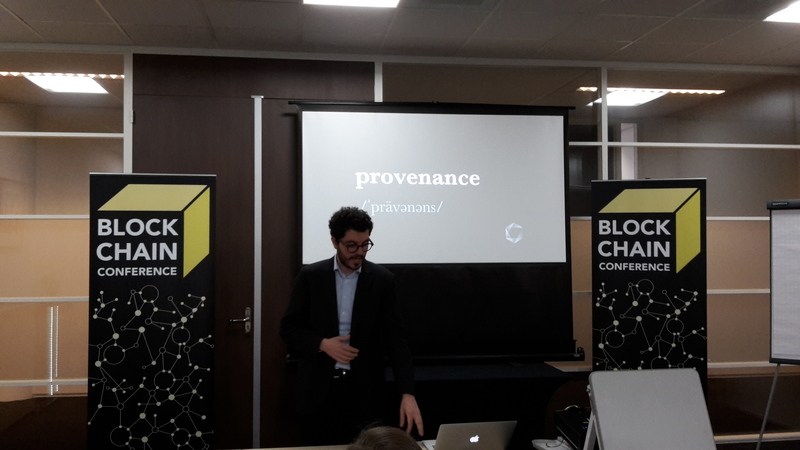 The proceedings consisted of an introductory talk about blockchains, presentations of startups and panel discussions. Blockchain as a concept is associated with cryptocurrencies, mainly Bitcoin, now also Ehtereum, and many more. Usually virtual currency platforms are open source, because whoever gets involved wants to see that there’s no backdoors or bugs in the code that may threaten serious use of the currencies or the blockchain code. I will go through a number of aspects of blockchain technology, first the blockchain itself. To most a blockchain has no meaning, so to explain, a blockchain (because it is a more or less general design) is a system that stores transactions. It does so by grouping transactions into blocks, and then chain encrypting them. This means that all information on transactions of block one creates a code, called a hash, that is included in the information of block two. Block two also creates a hash, which will be included in block three. The result of this mechanism is that it is very hard or impossible to change information in block one (or any previous block), because it would change the hash, both for block two and block three. The data of the blockchain is distributed over the people that want to use it to store transactions, and if you try to look up a block it is only blocks that can be verified to exist and have a certain hash (the one included in the following block) that you can use to check your transaction. This means the distributed system running the blockchain creates a single transaction history, which is immutable as long as you don’t change all subsequent blocks on a majority of existing datastorage devices. Blockchains are not new, they are the principle way in which most document encryption works. If you take a large document and try to encrypt it, the encryption algorythm can’t just take the whole thing at once, it cuts it into blocks of a standard size and uses so called padding to fill in the rest. Then it encrypts the first block, uses a hash of the first to encrypt the second block and so on. So all encrypted data is in blockchain format. When it is decrypted the process is reversed. The hash is not used because it is a one way process. Why Bitcoin and Ethereum and others are disruptive is that it uses the blockchain as described above to maintain a public ledger. Bitcoin was designed to exchange so called Bitcoins over a blockchian being run over many nodes. None of the nodes, peers or computers in the network would have authority over what did or did not get included in blocks, this would be a democratic process. Today the Bitcoin sphere is dominated by a handfull of large miners, but because bitcoins are used by many for transactions, it has a value like any currency, it can be traded without tax between other currencies at least in the EU. A trustless network is like a game you play by the rules. The rules can only be changed democratically, nobody needs to trust anyone to follow the rules, they are baked into the cake. At times there are alarm bells on Bitcoin because mining becomes increasingly unattractive (this is the process of creating new blocks of transactions and peer verifying them) as it is a energy intensive enterprise, It is not clear if Bitcoin will retain its value in the long run. It does prove a point that the creation and use of such a virtual currency in a network that is basically uncontrolled is possible. This is not surprising, gold coins worked for centuries and where also trustless. What is surprising is that this worked in the digital sphere, which always has a cost associated with it. Bitcoin and Ethereum and other blockchain currencies do have a development community, and sometimes this community is divided. This community decides on parameters that affect the usefullness and value of a blockchain, and for most users who can not code this means they have to trust these developers to do the right thing. A blockchain require work to exist. It requires peers to collect transactions and put them into a block. It requires the verification of existing blocks by peers. This means a lot of calculations and these are energy intensive. Running a wallet (the name for a node in the network of blockchain peers) means you join in confirmation of hash calculations of blocks, sometimes from the first to the present of the blockchain in question. To compensate there is a mechanism that rewards this work, which is called mining. Mining is the term for ‘working’ to gain Bitcoin or Ether or some other cryptocurrency associated with a blockchain. It is not finding a prime number, it is basically guessing a number. One of the least attractive aspects of the current blockchain is that all mining participants are trying to gain currency by mining and to that end expend money on electricity. The idea is that the first one to ‘guess the number’ closes the latest block and gets a reward, and all participants are competing for this reward. On average the reward can be calculated and this provides the incentive to invest in hardware and electricity. This guessing is otherwise completely useless. This is the worst aspect of Bitcoin and Ethereum. It causes immense CO2 pollution where this is not needed. The main reason is that the network is trustless, so it needs more protection against attacks, and one of the ways to do it is to distribute a burden which one ‘player’ could never carry. In a closed system this need not be the case. Ehtereum allows you to create currencies that use the general Ethereum blockchain and mining so many currencies can be created at the cost of one ‘guess the number’ process. This has also been implemented with bitcoin but was not inbuild. A next generation public blockchain will have to have alternative ‘proof of work’, but the cryptocurrency associated with the blockchains is not the main advantage of them, especially not of Ethereum. The main advantage is to have a trustless data and code store that is hypertransparent and can be used for many purposes. More about that now..
May organizations that wonder whether to use blockchain systems to store data do so because they understood that this data will be permanently stored and visible, like set in stone (as long as the blockchain exists). The IT industry does have a sector that is the current protector of data : The database community. Databases can be distributed as well, they are super proven technolology with billion dollar companies like Oracle providing solutions for most major companies. Websites usually use MySql (owned by Oracle but free for use), Microsoft has SQLServer products associated with their own server versions of the Windows OS. The difference between a blockchain and a database is simple to explain. If you are dealing with a database you have two aspects : 1. Storage of data, done in files on the server. and 2. Mutations of this store. In the case of databases a mutation results in changes in the files on the server. If you look up data your database solution will have a file with a map of the other files, using it to find the right file, open that and look up your data. A blockchain also has a store of data and it also allows you to mutate the data. But its store of data is distributed over all the transactions recorded on the chain. So if one wants to store data in the blockchain one could make a transaction with the table, field of choice, and leave the data in the chain. Then if someone wants to look up that data it has to find the transaction and reconstruct the data. So the big difference between both storage media is that a database provides ready low work access (is optimized for that) and a blockchain requires more work. But in return a blockchain solution can be very low maintenance, in fact, you can download and run an Ethereum Wallet, store data, close the wallet and access the data years later with zero overhead. Even if you want to run your own blockchain nodes it is a process that can be done by non-IT personell on their desktops. The best example of an application of blockchain technology was shown by Adi ben-Ari of Applied Blockhain. He uses the blockchain to store data on diamond properties and provenance. This is very important mainly to protect the major stakeholders in that market, also to protect against or exclude modern synthetic diamonds. It provides a means to control diamonds as a currency for illegal transactions. The applications are set to grow from diamonds to art to other valuable goods. Applied Blockchain uses a private network of nodes who can rely on it to keep a fair and impartial record of transactions. Other applications where in fintech, possibly easing or elimination accounting load, and factoring, loan administration. Another application is triggering maintenance alerts. This process requires commitment by developers. this commitment is usually bought by initial release of the associated cryptocurrency, so Bitcoin developers who mined them easily in the biginning are now all multi miljonairs (sort of, cashing in is not a straightforward process). This also goes for Ethereum and the DAO a trustless organization that emitted it’s own currency to its stakeholders at the start. The question is what happens once a blockchain has been launched. Once the initial work is done and a more or less stabile wallet (node) can be downloaded and transaction velocity is ok. Then who keeps track of the code, who prevents the initial builders to leave to sit on a tropical island or plant billions of trees in India. The code that is used to access and store new data in the chain may bifurcate and this obviously creates risks. My view has been that there needs to be key stakholders to a certain blockchain, ones that require others to use it. So for instance all lawyers could require payment in legalcoin, so that anyone requiring legal assistance would need to buy those coins and thus support the existence and maintenance of the supporting blockchain. This is the only way any cryptocurrency is secure long term. All currencies we know are either physical or mandated as method to pay taxes, like the Euro. If an industry or sector decides to adopt a blockchain mechanism for certain purposes it can do so privately, internally, and this creates an extra layer of trust in the interactions. Some private blockchains are encrypted, which does create risks because who holds the key? What if the key is lost. A major benefit of the current blockchain environment is that the code is open source, so whoever wants to experiment, can with a low treshold. Human trust networks are easier to move politically, so special interests and self interest can be more easily and less visibly served. The current stake holders in the most important trust networks do not want to motivate people outside thier sphere to develop block chain applications. Some financial applications like stock exchanges can not be implemented on a simple block chain because stocks traded often do not belong to the parties trading them (yet) or even exist. Market making would require large reserves of real stocks, which is uneconomical. At least three speakers in the conference claimed there where no applications of blockchian technology yet where very bussy developing applications and speading information about it. Of course the common meetups (free) are a bit neurotic, so there was also someone that wanted to provide a solution to that (the good cop so to say). This all shows classic patterns of capture, protection and distraction around the blockchain community. Even in the community there where people driving a spectacle of adversarial opinions, which really don’t matter in an open source community (but do matter to people wanting to protect their hoard of inital cybercurrency). Blockchain technology has real world applications, and can save a lot of money in some of them. They are no threat to some human trust networks that will never adopt them, even if they understand them, because they like and want the human in the loop. A DAO, or distributed autonomous organization with mechanistic application of rules will never fly from the developer community, and besides it is already here, it’s called capitalism or economism. If you have questions or want to apply blockchain technology you can contact the author at frits@rincker.nl . We will offer generalized documentation certification and web content certification and are open to proposals.